indicating meter and attenuator control have been located side by side and given equal prominence. The mask was added to the attenuator control to reduce the possibility of errors in reading the sound level, which is the sum of meter and attenuator readings. The microphone is shown in operating position. When not in use, it is folded down so that it rests in the small well at the right. The on-off switch is operated by the microphone swivel post so that the instrument is automatically turned on when the microphone is raised to its operating position. The welded aluminum case designed to house this new meter is light in weight, strong, durable, and attractive. 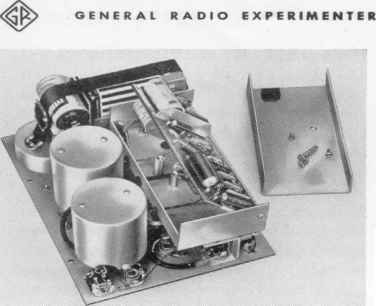 Four large rubber feet mounted on its base serve as a first stage in shock and vibration isolation for the high-gain amplifier carried within. The end frames of the case are molded from high-impact-strength bakelite and serve to protect the panel and controls when the instrument is in use. They make possible a simple U-shaped cover design, which can be attached quickly and securely, and they prevent marring and scarring surfaces when the instrument is set down in other than its operating position. Figure 3. View of Type 1551-A removed from its case. Amplifier cover removed, and amplifier raised to show accessibility. second stage of shock and vibration isolation. In addition, the input tubes for the pre-amplifier and main amplifier rest between pieces of light cellular rubber when the amplifier cover is in place. The attenuator switch and weighting switch are enclosed in the two cylindrical shield cans at the left of Figure 3. 8 hours a day or 30 to 35 days' operation at 2 hours a day. The plate battery will ' give 18 to 20 days' operation at 8 hours a day or 90 to 100 days' operation at 2 hours a day. Tests to date indicate that over most of the useful life of the batteries, 8-hour stability of the instrument is within 0.5 db and 2-hour stability is within 0.2 db. For applications where continuous use of the Type 1551-A Sound-Level Meter is contemplated, a small a-c power supply has been designed. 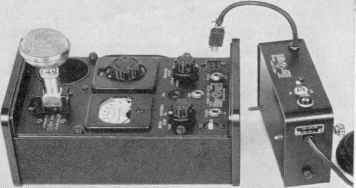 This power unit, the Type 1262-A Power Supply, is so constructed that it will fasten directly to the end plate of the sound-level meter case as is indicated in Figure 5. No regulation is provided in this supply, because the stability of the amplifiers in the sound-level meter is such that variations in line voltage over the range of 105 to s 125 volts cause meter reading changes of the order of only 1 db, so that normal line voltage changes have little effect on the meter reading. nd bottom side of Amplifier Shelf. kilocycles. For sounds arriving at 90° incidence, it is essentially non-directional (in the horizontal plane) for frequencies up to 6 kilocycles. Figure 6 is a group of generalized curves showing the response of this microphone to sounds incident at 0 degrees, 90 degrees, and from random directions in the vertical plane. The upper curve in Figure 7 shows the overall response to sounds of random incidence obtained for a typical microphone used with the Type 1551-A Sound-Level Meter. The lower curves show the response characteristics of the electrical circuits in the sound-level meter. 4E. E. Gross. "A Dynamic Microphone for the Sound-Level Meter," General Radio Experimenter, April. 1951. Figure 5. Type 1551-A with Type 1262-A A-c Power Supply. achieved in the new sound-level meter accounts for the close adherence of the solid curve to the dotted curve. If the input capacitance is increased as, for instance, when a long cable is used, the indicated output of the microphone will vary more widely with temperature as is shown by the middle and lower curves in Figure 8. Figure 6. (Below) Free field frequency response of microphone for sounds incident at 0 degrees, 90 degrees, and from random directions in a vertical plane. Figure 7. (Right) Typical acoustical and electrical calibration curves for the Type 1551-A Sound-Level Meter. a source of error because the presence of any object, such as the instrument case, in the sound field of the microphone can distort the field and hence affect the meter readings. In addition, the position of the observer relative to the source of sound and the microphone becomes very important. It has been experimentally determined that when the Type 1551-A Sound-Level Meter is held as shown in Figure 9, these effects are negligible for frequencies up to 2 kilocycles for sounds in the horizontal direction (90° incidence, Figure 6) which arrive from the left- or right-hand side of the observer. In contrast, the observer will affect meter readings by as much as 3 db at frequencies as low as 200 cycles if he holds the instrument as in Figure 9 and faces the source of sound. 5H. F. Olson and J. Preston, "Unobtrusive Pressure Microphone," Audio Engineering, Vol. 34, pp. 18-20 (July, 1950). s.J. K. Hilliard. 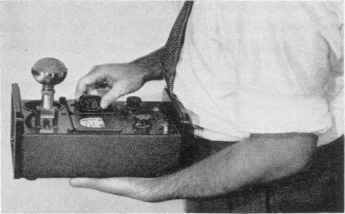 "Miniature Condenser Microphone," Journal of the Society of Motion Picture and Television Engineers, Vol. 54, pp. 1-12 (March, 1950). 7Type 1551-P1 Condenser Microphone System to be described in a forthcoming issue of the Experimenter. Figure 9. Typical operating position for Type 1551-A Sound-Level Meter. Microphone Assembly* will give better results for measurements above 2 kilocycles. For even better results at high frequencies, a Western Electric Type 640-AA Condenser Microphone or one of the recent high-fidelity microphones, such as the RCA Type BK4A5 Pressure Ribbon Microphone or the Altec Type 21-B6 Condenser Microphone should be used. Because good low frequency response is also important in noise measurements, a condenser type of microphone will be offered as accessory for use with the Type 1551-A Sound-Level Meter. The development of a battery-operated preamplifier and power supply7 for this type of microphone will be completed soon. Figure 8. Variation in response as a function of temperature for the microphone alone and with various lengths of cable between microphone and sound-level meter. meter is commonly used in industry, in schools, and in laboratories to obtain objective measurements of a wide range of noise levels. The list of its applications for the measurement of noise or unwanted sound is growing rapidly. Many measurements are made in the process of reducing the noise in consumer products or in improving worker comfort, safety, and efficiency. With the advent of high-intensity noise makers, such as jet engines, test facilities must be carefully engineered and designed, not only for protection and comfort of test personnel, but to prevent undesirable noise conditions extending to surrounding communities. Every effort has been made to make the Type 1551-A Sound-Level Meter an outstandingly useful instrument. The broad frequency-response characteristic, stability, wide dynamic range, and low noise and distortion level, resulting from careful design of the amplifier, attenuators, and output system, make it an excellent foundation on which to build a comprehensive sound-measuring system. Special microphones can be used to full advantage. The output is adequate to operate many pieces of auxiliary equipment, such as frequency analyzers, graphic level recorders, magnetic tape recorders, or cathode-ray oscillographs. In addition, this new sound-level meter is compact and light in weight, so that it is much easier to carry about than the old Type 759-B. Its over-all size is 470 cubic inches, compared to 1200 cubic inches, and its weight is 11 pounds, compared to the 22^ pounds of the Type 759-B.